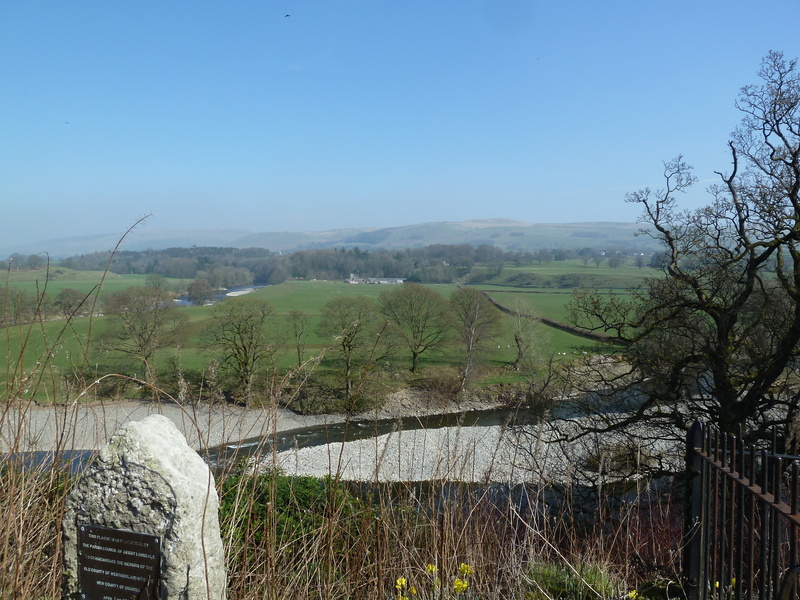 We shared in the gorgeous weather this weekend and after a hard day’s labour digging on the allotment on Saturday, Sunday we went to Kirkby Lonsdale to meet friends and a visiting Historian of Science for lunch. 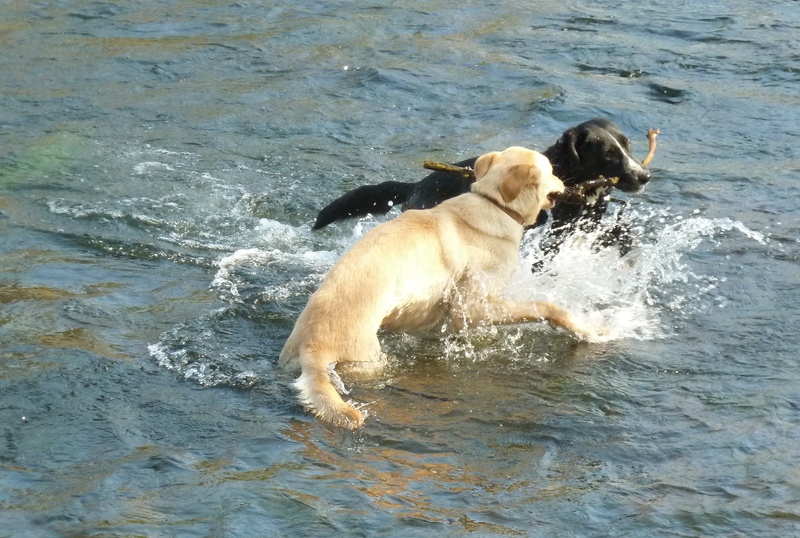 As it was such a lovely day we went early to walk the dogs along the river. 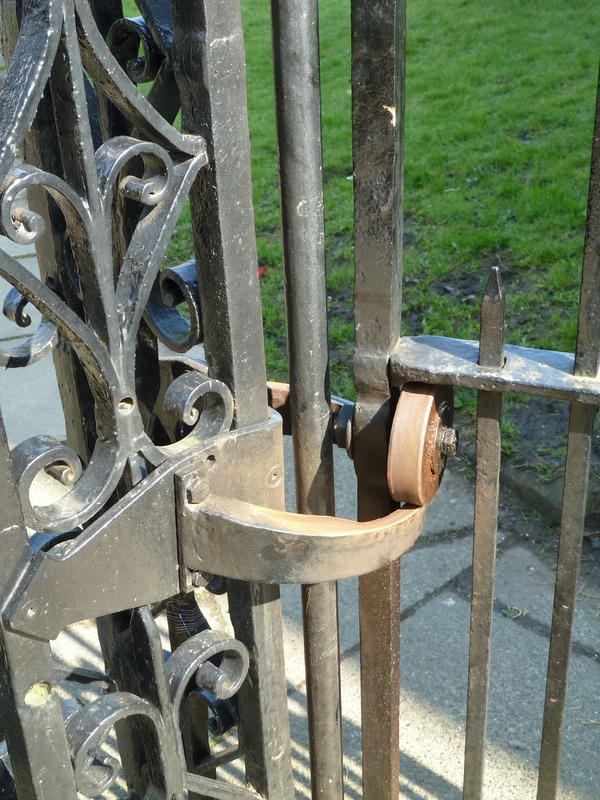 From the town, you can access the River through the churchyard, which has the most fabulous gates. The self closing mechanism is the perfect combination of simplicity and ingenuity. Well greased, it’s satisfying smooth and perfectly weighted. The church structure is predominantly Norman and has some lovely stained glass windows featuring patterned glass. 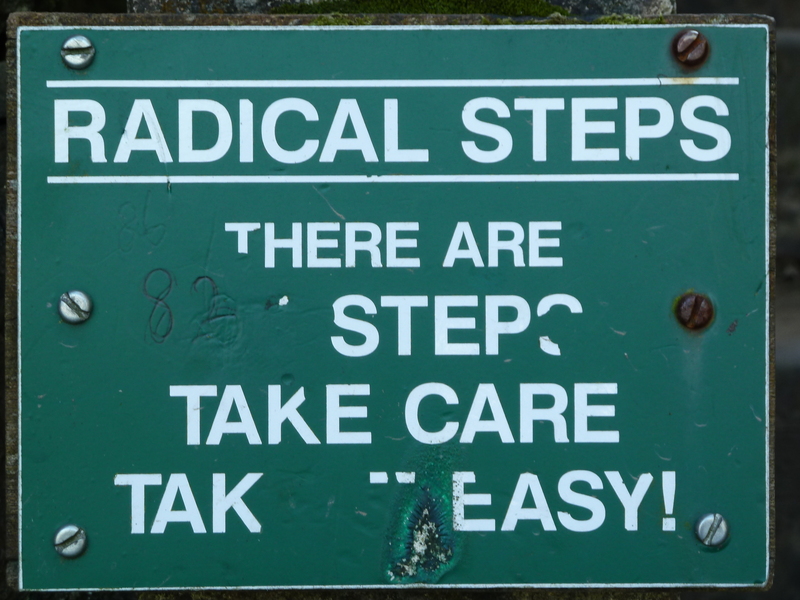 At the end of the churchyard, you come to the top of the ‘Radical Steps’. 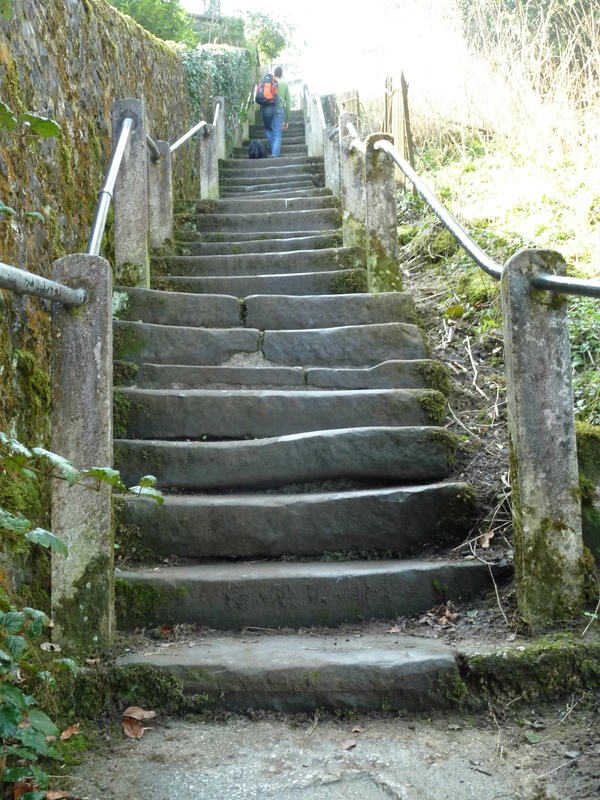 Built in 1819 by Francis Pearson, they became known locally as the Radical Steps due to Pearson’s radical political persuasion, although it could be due to their radically different sizes which mean you do have to look at them whilst climbing or, after a particularly high step you may overshoot the next much lower step. They are much easier to ascend on four legs it seems. 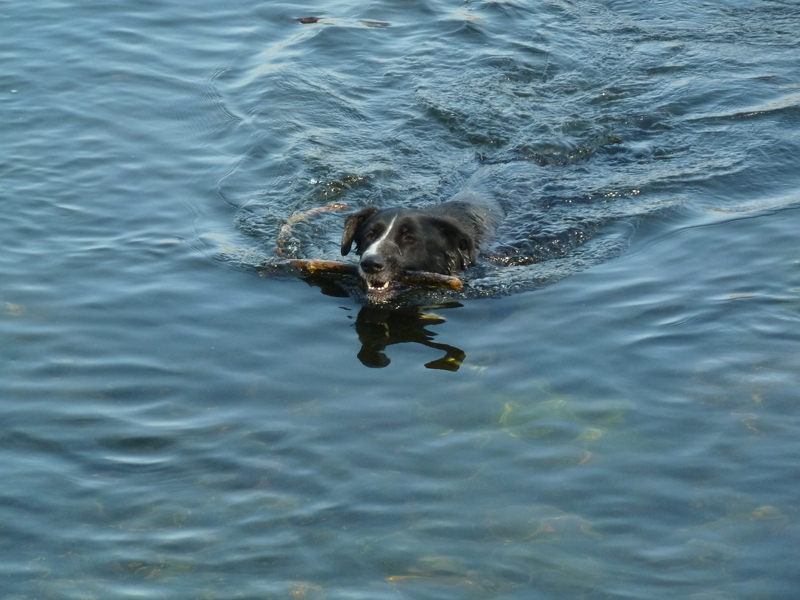 Spider loves to swim so was in his element fetching sticks from the River. Wilbur is much less sure of the water and this as far as he would go; waiting for Spider to come back with the stick and then try and steal it from him. I had taken my knitting with me and knitted on my new hat sample whilst holding our outside table and waiting for the others to arrive. My partner is an Historian of Science and Medicine and I did my PhD in a Science Studies Centre so lunch conversation was fun. In 1875 Ruskin claimed the view was ‘One of the loveliest in England and therefore the World’. 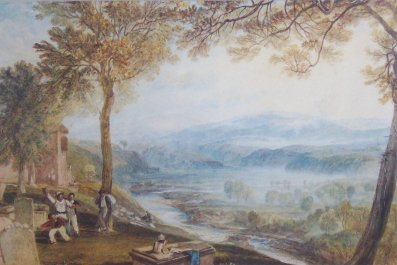 Turner also painted this view in 1822, although from a vantage point in the churchyard rather than further along and thus providing a more truncated view. 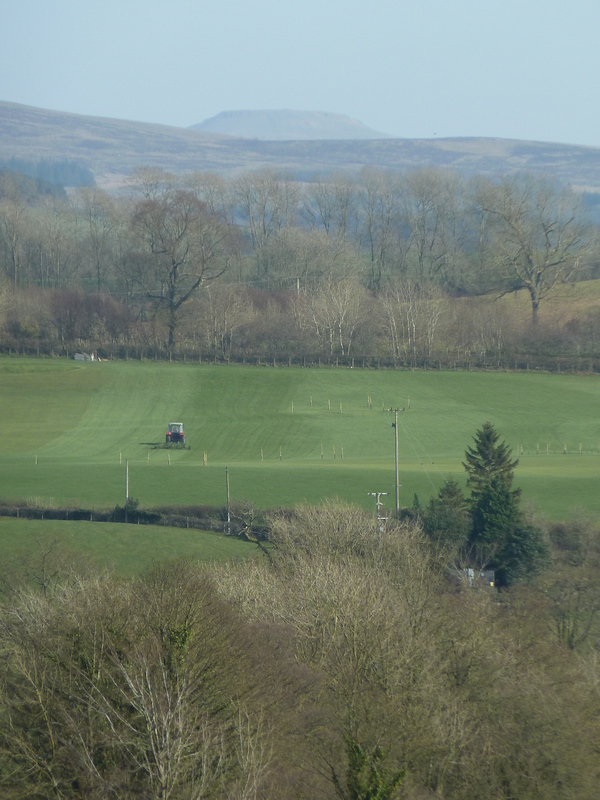 From Ruskin’s View you also get a good view of Ingleborough, the second highest peak in the Yorkshire Dales. I did comment that that not only is it a great walk, but if you start from Clapham you can stop off at Beckside Yarns at the start, as I’ve previously blogged. Many years ago, before there was a bridge in Kirkby Lonsdale, an old woman lived on the banks of the Lune and kept a few animals. One night her cow strayed across to the other side of the river and would not come back. In response to her predicament, the Devil appeared and promised to build a bridge by morning in exchange for a soul – the first to cross the bridge, thinking that it would be the woman herself. By morning the bridge was complete and the old woman agreed to fulfil her part of the bargain. She delved into her bag and threw a bun across the bridge, whereupon her small dog ran over to retrieve it. The devil, in a fit of rage at being thwarted, howled in anger and vanished leaving behind a smell of burning brimstone. Now the Bridge is a popular meeting place for motorcyclists and they were out in force on Sunday. In the car on the way back I started knitting again and our guest commented that he knew a knitter. Well doesn’t everyone? Another Historian of Science he explained, but one who gave up academia to pursue knitting full time. Well that rang a bell so I asked ‘who’, and was told ‘ Elizabeth Musselman – the name was immediately familiar. Our guest was rather surprised that I’d heard of his friend, but then Elizabeth’s Langsroth pattern has been in my Ravelry queue for months. I had hoped to make it for one of my nephews for Christmas, but it never quite happened. I had to explain what Ravelry was and how it connected knitters from all over the world, which he thought was rather cool. And I must agree, it is. There are many similarities I could draw between academic communities and knitting communities, and many differences. Long ago I made my choice not to become an academic but to take my academic training into a more direct form of engagement with the communities with which I work. informed pun about how SSK not only stood for the sociology of scientific knowledge (the term familiar to most people in the room), but also slip, slip, knit, a technique for rearranging a set of individuals into an integrated whole. I know which SSK I think works best, and I’m a knit 2 together through the back of the loops person, so that’s sayig something! How wonderful to discover you and your blog through this post! (WordPress alerted me that you had linked to my blog.) What an amazingly small world it is — and of course now I’m very curious to know who your friend is…. Another indicator of how small it is: I was just thinking about the Yorkshire Dales earlier this week because I’ve been reading The Old Hand-Knitters of the Dales. I really enjoyed my most recent trip to the UK — just got back yesterday — and when I return I’m hoping to get up to Yorkshire. All kinds of enticements there, including the fact that that’s where my grandmother emigrated from. So I hope that we get to meet in person sometime! In the meantime, I’ll be enjoying your lovely photos and adventures on your blog. or anything else that you can find that weighs approximately forty five pounds. But chocolate candy bars high in chemicals, wax and sugar are not beneficial at all. Most red wine is not sold until it has been in the bottle for at least two years.